The Indian mathematician Srinivasa Ramanujan Aiyangar (1887-1920) is best known for his work on hyper geometric series and continued fractions. Srinivasa Ramanujan, born into a poor Brahmin family at Erode on Dec. 22, 1887, attended school in nearby Kumbakonam. By the time he was 13, he could solve unaided every problem in Loney's Trigonometry ,and at 14 he obtained the theorems for the sine and the cosine that had been anticipated by L. Euler. 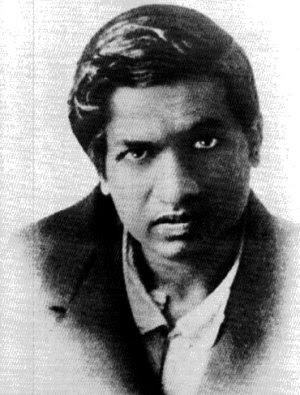 Ramanujan became so absorbed in mathematics that when he entered the local government college in 1904 with a meritscholarship, he neglected his other subjects and lost the scholarship. Ramanujan married in 1909, and while working as a clerk he continued his mathematical investigations. far beyond, some of the latest conclusions of Western mathematicians. In 1914 Ramanujan went to Cambridge. The university experience gave him considerable sophistication, but intuition still played a more important role than argument. In Hardy's opinion, if Ramanujan's gift had been recognized early, he could have become one of the greatest mathematicians of all time. His patience, memory, power of calculation, and intuition made him the greatest formalist of his day. In 1918 Ramanujan was elected a fellow of the Royal Society and a Fellow of Trinity College, Cambridge. However, the story goes that , Ramanujan’s health deteriorated greatly while he was in England, and he eventually had to travel back to India in 1919. He died a year later, when he was only 33 years of age, although his work will be remembered for a long time. He dealt with Riemann series, the elliptic integrals, hyper geometric series, and functional equations of the zeta function. Hardy liked to rank mathematicians on a scale of 1 to 100, and he gave himself 25, Littlewood 30, David Hilbert 80, and Ramanujan 100, which shows just how great Ramanujan was.